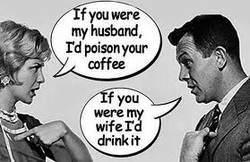 We love a decent cup of coffee. The Aeropress has quite a lot going for it. It's a very simple concept - a plunger above your cup is the basic premise. You have a cap which requires a micro filter (paper or metal - we have used both and both are equally good. The metal one, you just need to take more care that when you dispose of the coffee grinds, that you don't accidentally dispose of that filter). Place the cap onto the end of chamber, and place over a sturdy mug. When I first did this, I was sure the cup would tip over when the plunging began - it didn't, but take care as you will be using hot water. Fill the chamber with your coffee grind (drip coffee grinds work well. We use the coffee grinds that we use in our home espresso machine). Follow the directions provided on how much you will need for the amount of coffee you require. Add your hot water, and stir the coffee whilst still in the chamber. You need to add the right amount of hot water for the amount of cups you will be making. The chamber has markings on it to assist you. Follow them! Give the coffee a quick stir, and then its time to plunge! Plunge slowly, and you will see the water being forced through the filter to give you a lovely strong coffee. The plunger does provide some resistance which is normal. Just maintain a strong steady pushing motion. It takes about 20 seconds or so to push through to the cap. 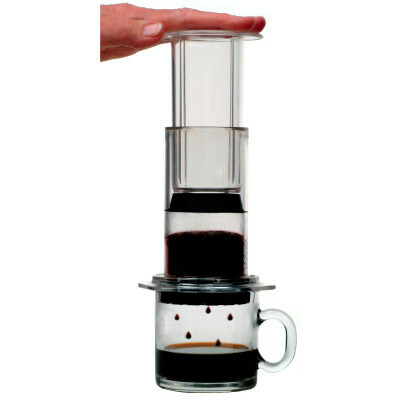 At that point lift the Aeropress off, and invert it. Take off the cap, and with a final push of the plunger, a little round puck of grounds is expelled into your bin/ground. The filter should remain in the cap, for easy removal (dispose if its the paper one, or clean up if its the metal filter). Very neat! And easy clean up too!. We think this is a great method of getting a excellent cup of coffee when you are travelling. I have read some other reviews, and generally the comments are extremely favourable. All agree that its compact, easy to clean, and produces a great cup of coffee. A negative that does come up, is that it goes over only 1 cup, so not suitable for a few people. For us, that is not an issue. As its quick to make a coffee, we simply eject the grinds and start over again. The temperature of the water is meant to be an ideal 75-80 degrees Celsius. We don't carry a thermometer around with us, so we just guess! Maybe some of the truer coffee connisseurs do, but that seems like a little bit too much effort when we camp.